Producer Yoshinori Ono is a notorious internet troll, and he's apparently no longer content merely teasing Street Fighter fans. Currently we know very little about Deep Down. It's a PlayStation 4 game, and it's some kind of swords n' sorcery fantasy joint, but as for plot details and even who's working on the thing, we're basically in the dark. It's been rumored for a while now that Yoshinori Ono, producer of Street Fighter IV and its various updates, was helming the game, but nothing has emerged to confirm that news. Well, unless you consider Yoshinori's usual antics to be proper confirmation. The image you see at top-right was dropped into the swirling miasma of collective human thought that is Twitter. 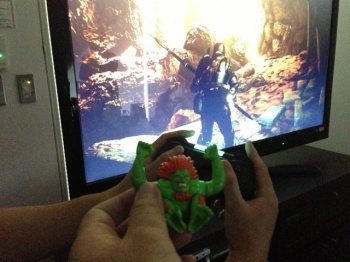 That Blanka action figure is Ono's trademark and it pops up in almost every image the man shares. Behind it however, is one of the very first images of Deep Down not taken directly from the game's official announcement trailer. According to the always-hilarious wonders of machine translation, those Japanese characters apparently mean "Development in progress! For solo play can be PS edition 4. I'm debuting soon, and as much as possible, and." We're going to read that "This is the in-development singleplayer component of the PlayStation 4 game Deep Down. I, Yoshinori Ono, will be revealing a relative wealth of further information tout de suite." While this isn't really much information to go on, it is arguably more useful than yesterday's story denying a link between Deep Down and Dragon's Dogma. Plus, Ono is delightful, and unlike Christian Svensson he's polite enough to offer a cutesy Blanka picture anytime he might be forced to crush my dreams.